Visitors to Niagara Falls are familiar with the Main-of-the-Mist, small excursion vessels operating from both sides of the Niagara River that carry passengers on daring up-close trips to the foot of the falls and back down stream. The vessels always appear to be in view, and many visitors to the falls have enjoyed boarding the vessel and taking the ride. There are two Maid-of-the-Mists making the trip these days. They are Maid’s V and VI, two relatively modern steel boats with powerful diesel engines. 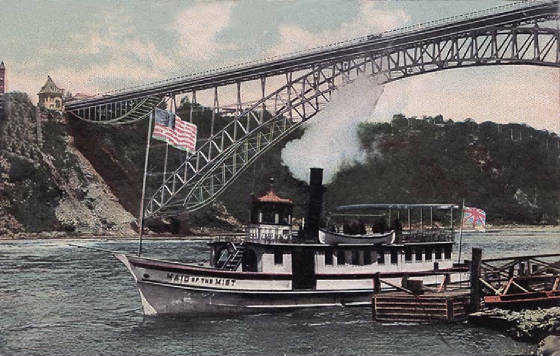 But the history of small excursion vessels bearing the name dates back to 1846 when the first Maid-of-the-Mist was launched as a ferry, carrying people to and from the U.S. and Canadian sides of the Niagara River. Two years later, when the Rainbow Suspension Bridge was completed, the ferry service shifted into what is now the excursion service for tourists. That first boat was a two-stack steamboat powered by side-wheel paddles. It operated successfully for eight years before it was joined by a larger and more luxurious 72-foot-long steamboat. Maid-of-the-Mist I looked a lot like the first boat, with two smoke stacks and paddle wheels on the sides. The tourist business was slow during those years and the Civil War was looming. The two boats were sold to Canadian owners. Between 1860 and 1886, there was no Maid-of-the-Mist operating on the lower Niagara River. Then a firm established as the Maid of the Mist Steamship Company launched a new steam powered propeller-driven steamship and revived the excursion service. This boat, later to be known as Maid-of-the-Mist No. 1, was 71 feet in length and looked somewhat like the original vessel, except it lacked the large paddle wheels on the side. Business grew and by 1892, Maid-of-the-Mist No. 2 was launched. It looked like its sister ship except it was slightly larger at 76-feet. These two vessels operated regularly every summer until April 1955, when they were both destroyed by fire while moored alongside each other at the company’s Ontario dock. The origin of the fire was unknown. The Maids-of-the-Mist operating on the river today were both launched later in 1955, to replace the boats that burned. The boats are registered in St. Catharines, Ontario, and the company is owned by the Glynn family of Lewiston, New York.